First two home in the 2016 Great Eastern Run were Shadrack Korir (left) and Gideon Kimosop. Photo: David Lowndes. Kenyans were the kings of the 2016 Great Eastern Run today (October 9). All forecasts proved correct as hot favourite Shadrack Korir breeezed to victory in an time of 63.38 for the half marathon trip, almost two minutes outside the course record. Korir led home a Kenyan 1-2-3 as he was followed in by Gideon Kimosap and Josphat Kemei. A record 4,160 runners start the 2016 Great Eastern Run. Photo: David Lowndes. The first two are members of the Project Africa group which brings athletes from that continent to race in Europe, often for the first time. Kemei runs for the Run Fast group as does ladies winner Teresiah Omosa, also from Kenya, who won the women’s race by 10 seconds. Korir won the Cardiff half marathon last weekend in a rapid time of 60.54 (46 seconds faster than the GER record) leading to hopes that the course record would be broken for the second year in a row, but the pace of the race was sluggish at the start and winning the £750 first price became Korir’s priority. Kimosap added: “Shadrak is much quicker than me, but he let me stay with him until about two kilometres from the end, but then he ran away. The course is very fast and there were only a couple of windy parts. Stamford’s Aaron Scott - who runs for Lincoln Wellington - actually led the race for the first mile or so before the Kenyan contingent pounced and left him well behind. Scott finished in a creditable fifth place overall and took the prize for first UK runner. The first local lady to finish was evergreen Philippa Taylor who also took the over 45 lady prize in a time of 1.22.55. 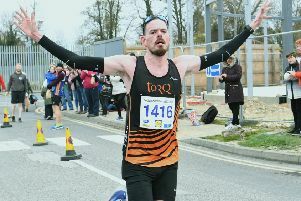 A record 4,160 runners took part plus five wheelchair entrants and 1,396 in the fun run. Local clubs Eye Community Runners and Nene Valley Harriers took the Fun Run honours through Isaac Ellwood (15) and Ella Robinson (13) respectively. Girls: 1 Ella Robinson (Nene Valley Harriers).